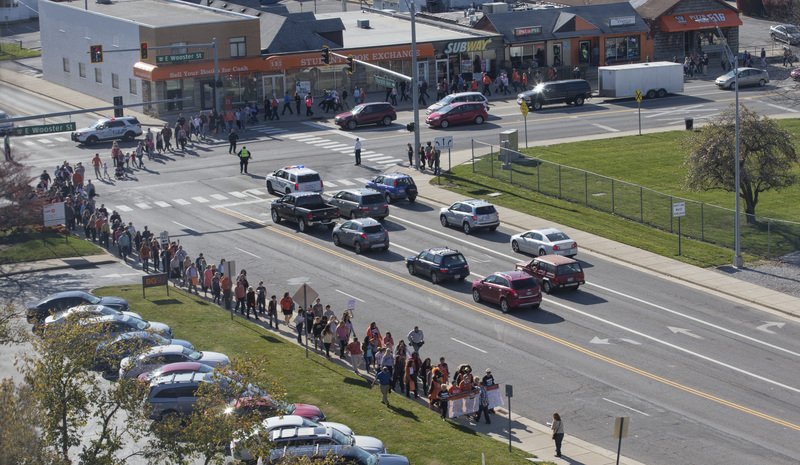 Here at Not In Our Town we are very familiar with Bowling Green because of their outstanding work in the community and on the campus to stand up to hate and intolerance. This story isn’t just about highlighting the dangers of hate, it's also helps communities prevent it. It started in the fall of 2012 with an arson attack on a mosque in nearby Perrsyburg Township. Then swastikas and racist messages were painted on the driveway at the home of the Bowling Green State basketball coach. When racist tweets aimed at Black students circulated on social media, a group of campus leaders at Bowling Green State decided it was time to take action. The Black Student Union, Latino and LGBT campus groups were joined by fraternities, sororities and faculty members who held teach ins and rallies to address underlying issues of racism on campus and the community. The Diversity and Inclusion department in the President’s office provided the official endorsement and support for a campus wide series of events, and the university decided to join the national Not In Our Town movement. Students raised concerns about being pulled over by police in the local community, which led to the involvement of the campus and city police departments. In response, BG police cars were outfitted with highly visible Not In Our Town magnets that read “ Coming Together to Stop Hate,” to signal to students and others that the officers are aligned with students against hate and discrimination. The Mayor of Bowling Green signed on to have the City become a participant in the Not In Our Town campaign and urged residents to become involved. We told this story in a short film called A Bowling Green Legacy. What is most remarkable is that five years after it was launched, Not In our Town Bowling Green is now an established part of the culture both on the campus and in the community. The NIOT Bowling Green community group is co-chaired by a Presbyterian Minister and a former student - who was part of the original NIOT efforts on campus - that works on the BGSU NIOT project through the University President's Office. Today both these groups are flourishing and have a prominent presence in the community. 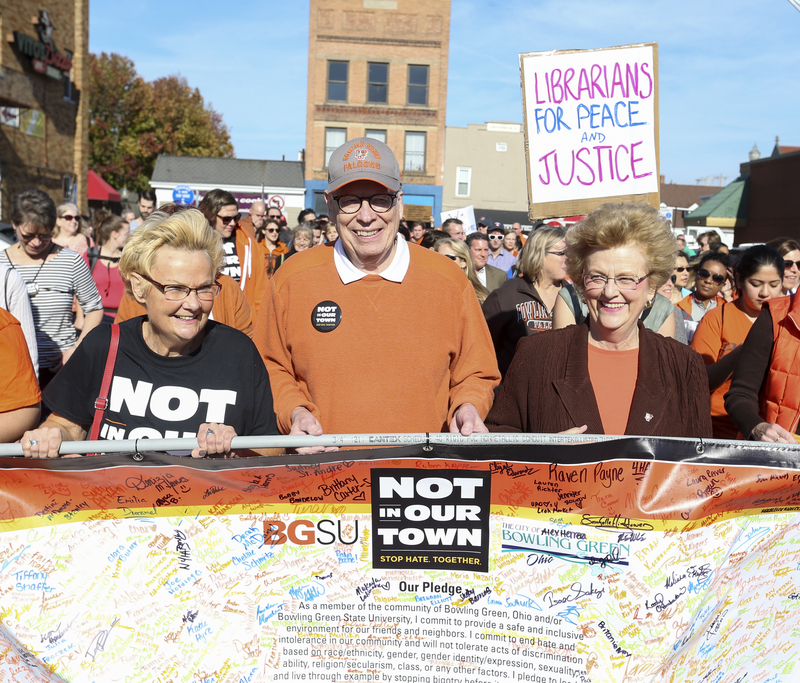 Days after the election, the Bowling Green Mayor, Assistant City Manager, and BGSU President helped lead a NIOT Peace March of hundreds through downtown Bowling Green. In addition to marches, they’ve held teach in’s about Islamaphobia, held discussions about the relationship between the Black community and police, and the school district has invited the NIOT committee to advise them about anti-bullying programs. When an Arab family’s home was defaced in Toledo, the Bowling Green NIOT group reached out to support them. Bowling Green has a story to share, and lessons for communities across the country about how we not only respond to hate, but prevent it from happening.